This is a bit of a OnePanWonder, providing you cook the bulgar wheat and the salmon ahead of time. Even if you don’t, it’s still a quick and easy supper dish that makes a few ingredients go a very long way and is super filling and nutritious. The original recipe was a Gousto recipe which I have adapted to include more vegetables and fish. Simmer the bulgar wheat and the crumbled stock cube in about 200ml of water until most of the water is absorbed and the wheat is cooked. Steam the broccoli florets in a colander over the same pan until all dente. Drain the wheat and set aside. Dry fry the cumin seeds until fragrant, then add to a pestle & mortar along with the chilli flakes, 1 garlic clove and 1/4 tsp salt. Crush to make a rough paste, then add 1/2 the chopped coriander, the rice vinegar and 2 tbsp olive oil and mix into a salsa. Set aside. Peel the onion and cut into wedges. Fry in a medium hot frying pan with the lid on but slightly ajar so they cook quickly and start to colour quite rapidly but don’t allow to burn. If they are cooking too fast, add a splash of water. Cut the courgette into chunks and add to the onions, stirring occasionally until both onions and courgettes are soft and golden. Add the ginger and other garlic clove and cook for 2 minutes. Add the broccoli florets and mushrooms and continue to cook until the mushrooms are done. 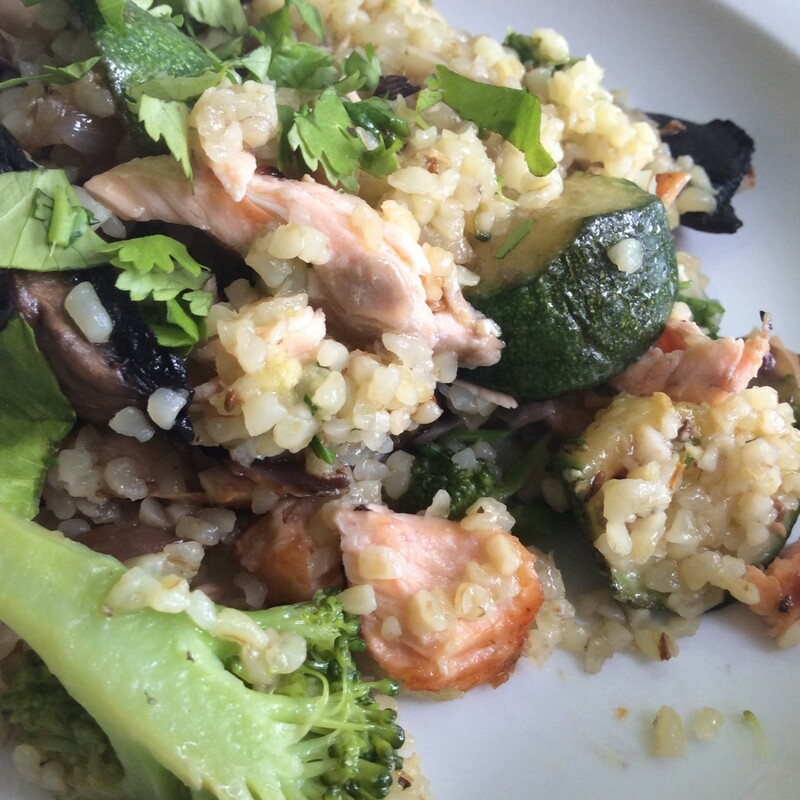 Stir the bulgar wheat into the vegetable mix and flake in the salmon, taking care not to break up the fish too much. Drizzle the salsa over the contents of the pan and serve with the rest of the chopped coriander. This recipe works equally well with prawns or with griddled halloumi. It is also fantastic with crumbled goats cheese or feta instead of the fish. It also saves time if you use a hot smoked salmon or even smoked mackerel in lieu of fresh fish, which makes it even more of a store cupboard standby.